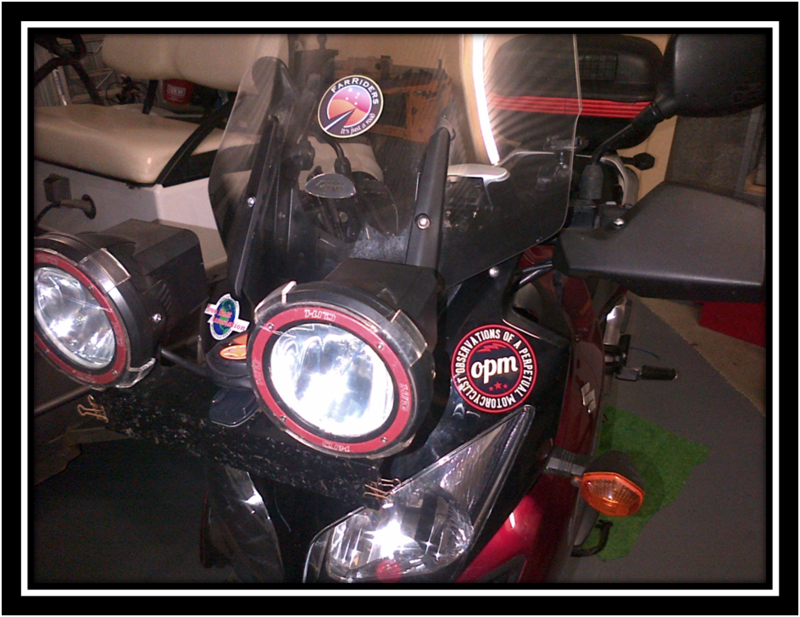 A fellow Blogger has a Web site Called “OBSERVATIONS OF A PERPETUAL MOTORCYCLIST” OPM for short. Click here to go to the site. A few weeks ago he posted that he had received some sticker with his LOGO and was willing to send a few out to the first few replies/emails he received requesting them. I was glad to hear that I had made the cut and the sticker was on the way, however was not to be used as I had originally thought. I arrived home from after 2 weeks at work to find that sure enough I had an envelope awaiting me with not one but 2 stickers inside. this made my next decision easy. I’ll put one on each bike. I think they look pretty cool. Along with the stickers he sent a Business card with his website address, email address and facebook address. Also very cool. 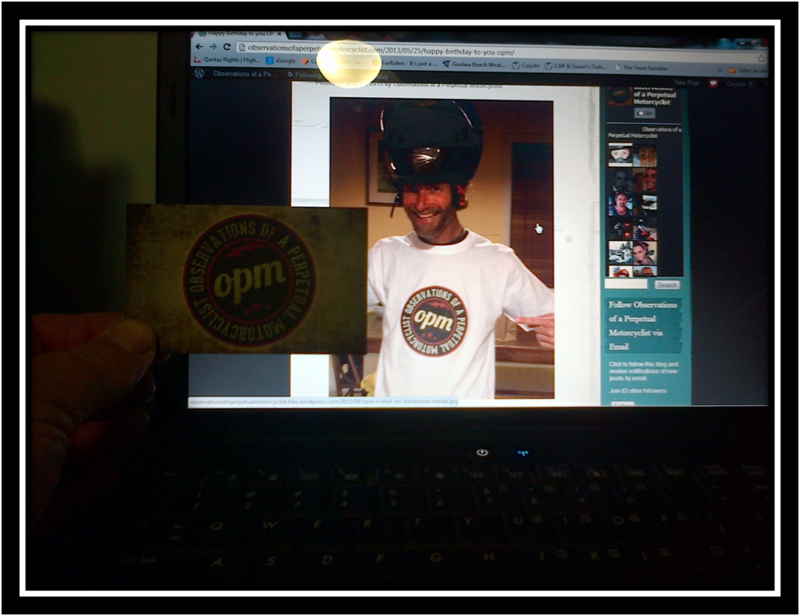 Thanks David (OPM). 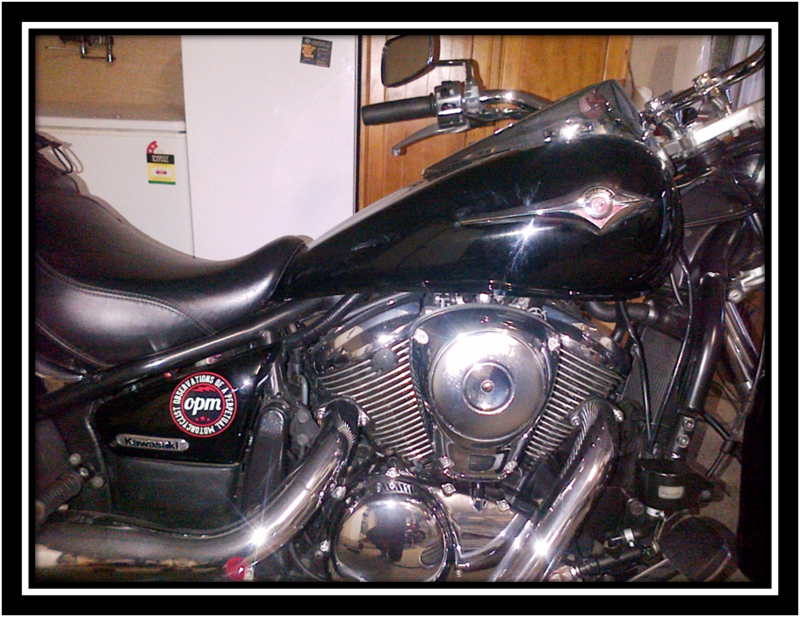 When I am asked about the sticker I will be sure to point them to your web address. Glad they arrived safe and sound Coyote, and thanks for the plug. Those bikes of yours look great. I particularly like the serious lighting on the V-Strom. I need some of those for spotting the wildlife around these parts. I installed the lighting when I lived in Cobar in the middle of NSW. I used to do some riding after or before light and……. well you know the size and amount of Roo’s, Goats, pigs and Emu’s out there. I recon the HID’s have paid for them selves many times over.